Can I fool you with the picture above? Apparently, some people think so. I’m a Twitter newbie, but I’ve already discovered that sometimes you can tweet what you think is a helpful piece of data, then find yourself suddenly caught up in an explosive controversy. When it’s the Brookings Institute and US News and World Report on one side and passionate e-patients on the other, a research tweep is liable to feel like a nerdy accountant who wandered into the OK Corral at high noon with neither Kevlar nor a gun. This happened to me when Niam Yaraghi of Brookings posted on the US News blog and the Brookings blog that people shouldn’t trust Yelp reviews in health care—the URL for the post actually ends “online-doctor-ratings-are-garbage”—because patients hadn’t been to medical school. I follow Charlie Ornstein, past president of the Association of Health Care Journalists, and saw his tweet that Yaraghi’s post seemed “to dismiss that patients are experts in their own conditions.” I read the conversation and blog post. Thinking that data often helps when people disagree, I tweeted a graph from research my collaborator Naomi Bardach and I had done showing that Yelp ratings had a correlation of 0.49 with ratings on the Consumer Assessment of Healthcare Providers and Systems (CAHPS) hospital measure (the state-of-the-art method of measuring patient experience). So who’s right? 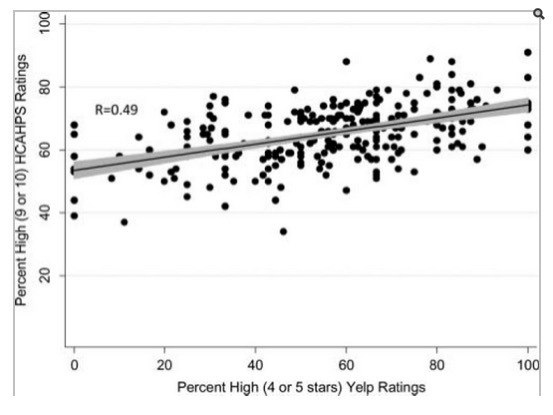 Do Yelp scores mean anything? Or are the correlations we described so weak as to be meaningless, suggesting that everyone should stick solely to the other measures Yaraghi mentions? In addition, we found that the relationship between Yelp measures and outcomes like death and readmission for three different conditions were all statistically significant, but lower (-0.13 to -0.39, with the negative sign meaning that, as Yelp scores went up, bad outcomes happened less). Herrnstein and Murray note, “The correlations between IQ and various job-related measures are generally in the .2 to .6 range.” Thus, our findings that the correlation between Yelp scores and heart failure mortality and readmissions were, respectively, -0.31 and -0.39 are in line with the strength of correlation between intelligence and job performance. Other people have found that patients’ experience ratings also correlate with the more technical aspects of care. For example, among patients with depression or anxiety, their experience ratings are predictive of also receiving the right counseling or medication. So I think most people would disagree with Yaraghi about Yelp (or other ways of capturing patients’ opinions) being meaningless, just based on the numbers. Furthermore, many would argue that “bedside manner” and “demeanor of the staff” are important in their own right. But Yaraghi does also have two important points, even if he hasn’t been very gracious about them. These seemed to have been thrown out with the discourteous bathwater by some of the patient advocates. First, not all Yelp reviews are likely to be helpful. Sometimes people get mad about things you don’t care about or random events happen. So, if a doctor or hospital has only a few ratings, you should be less confident that you have a good sense of how they are doing. Second, if there are other valid measures of quality available about them, such as the mortality rate for a cardiac surgeon, you probably want to take those into account when choosing a physician. I would rather have a surgeon who is a jerk but has very good outcomes than one who is warm but has bad outcomes (assuming that there really has been good adjustment for differences in the complexity or difficulty of the patients they see). So why is it that I conclude the errors in this conversation are mostly Yaraghi’s. One reason is just practical: you can’t get the valid measures he mentions for the vast majority of conditions that might make you ill. A woman with breast cancer cannot find the mortality rate for different cancer centers. A patient with multiple sclerosis cannot know which neurologist will prevent disability. In fact, if you want information on a specific doctor (other than her address, phone number, and where she went to school) it is virtually impossible to find. The science of measuring outcomes simply isn’t yet to the point that we have many measures that are really accurate at the individual doctor level (because of low sample sizes). Then, the politics of measuring outcomes means that nothing gets published by government or medical organizations until it’s deemed nearly perfect. When you combine the absence of the measures for which Yaraghi is advocating with the evidence that patients’ insights are associated with more sophisticated measures of quality and the ethical notion that their experience has validity in its own right, there’s only one conclusion. Niam Yaraghi and Brookings got this one mostly wrong. Adams Dudley, MD is Professor of Medicine and Director of UCSF’s Center of Health Care Value. Yes, you can’t make much of a doctor or hospital with just a few ratings. We excluded those with fewer than 5. But if one of those outliers appears in a slew of other ratings, it has less impact. Plus others use the accompanying narrative to decide how they feel (so if a 1 star rating says, “operated on the wrong knee” that will carry more weight than a 1 star rating for “office staff was slow”). This reminds me of an article on Amplio and surgical quality: https://medium.com/backchannel/should-surgeons-keep-score-8b3f890a7d4c. Sometimes quality is easier for lay people to recognize than we realize. Great post! Surgical volumes have been an issue for years but just won’t go away (e.g., in Spain, population 46 million, there are no hospitals that do 400+ CABGs a year and most are really low). And the idea of videoing and scoring is very novel. Using Pearson R’s on ORDINAL rank data? Why not carry them out to 4 decimal places, like some people now do with their GPAs?